Knitting since the dawn of time… OK, maybe since the day after the dawn of time, I spent the first day running around looking for wool & needles. I’ve said it before. I like working with old patterns. 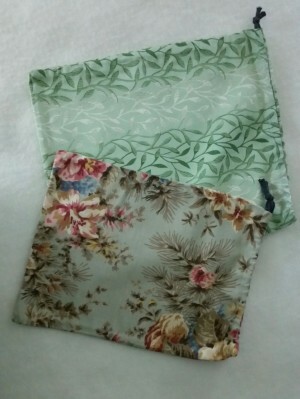 Recently during an organizing attempt to get all my stash and patterns in some sort of order, I came across a page that must have fallen out of a booklet somehow. 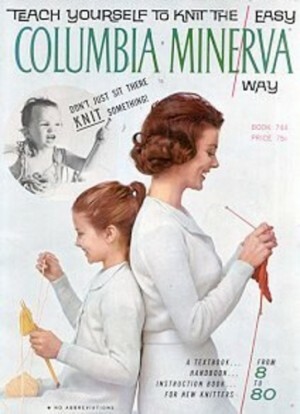 For the life of me I couldn’t find said booklet in my possession anywhere, so I am stuck with just this one lonely page, #32, which in researching I found came from Columbia Minerva #744 ” Teach Yourself to Knit, the Easy Way”. I’m guessing from the late 50s to early 60’s. Whether I saved it from oblivion, or perhaps my mom tucked it in with her old patterns handed down to me, I’ll never know. 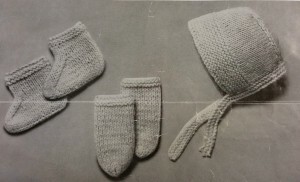 It seemed to be a rather straight forward type of pattern, 3 pieces, a hat, some mittens and bootees, all in rather a utilitarian, plain looking Garter and Stockinette Stitch combination. I was going to just scan this pattern page to save it digitally and then just discard the lonely page, but something made me stop. Could this be a pattern that my mother made? 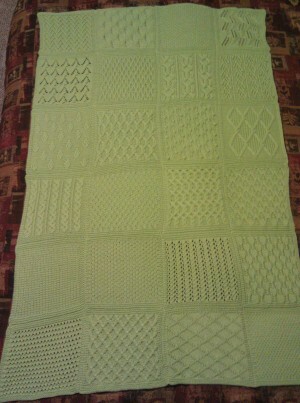 Was this Plain Jane pattern worth trying to make up? I thought why not, at the least I could donate the attempt to reproduce this to charity. And so the adventure started. 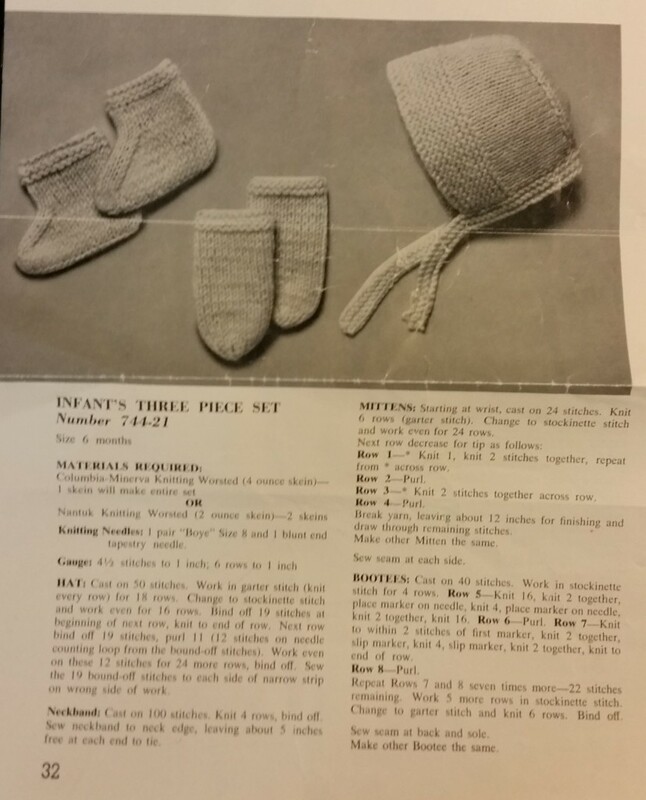 Looking over the written pattern, which takes only half the page for all 3 items, I noticed all the items were knitted flat, with seams to finish. 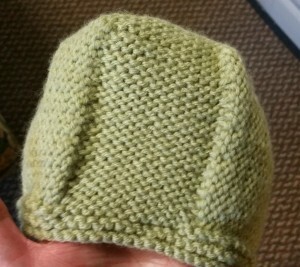 Two seams down the back of the hat, with an added seam to attach the neckband. 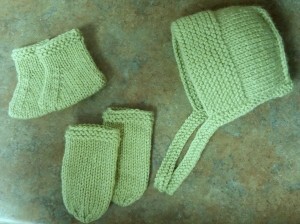 Each mitten had one side seam from top to bottom. 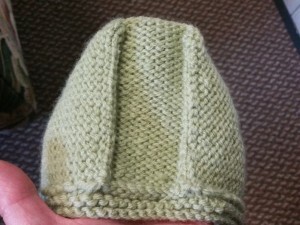 The bootees also had a seam down the back of each which continued along the sole. This may have worked for them back then, but we know we can do better! That was the voice inside my head telling me, or rather challenging me to do just that, a bit better using skills that might not have been widely available back then, or perhaps knitters knew them and it was just the yarn company’s way of getting a pattern to print quite small and quick. Either way I had sucked myself into this and began the re-write and re-knit. The Hat – for my first one, I followed the pattern as written and tried using the invisible vertical to horizontal weave to seam up the back. It looked OK, but the seams on the inside looked and felt rather bulky. So on my second try, I eliminated the 2 back of the head seams, because who wants some poor little baby trying to sleep with thick bulky seams at the back of his head. Then on my third try, I changed how the neckband was made, not separately and sewn on later, but rather picked up from the bottom edge. Thereby making the hat seamless and in one piece. The Mittens – for these the solution was easy. Simply cast on in the round with DPNs or using the magic loop method with circular needles. Seamless, one piece. The Bootees – here the solution wasn’t as easy. The original pattern had them cast on at the bottom, or sole edge, and then decreased working up toward the cuff. That would mean a seam across the bottom and up the back. The solution I found was working in the round with a provisional cast on that ends up being woven together with the Kitchener Stitch. 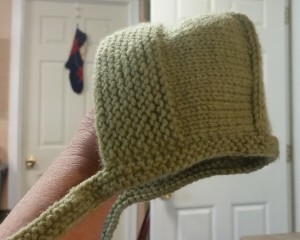 This also allows you to work the bootees just like the mittens, on DPNs or with the magic loop method. Seamless, one piece. Full instructions for the “encore” of all 3 pieces are here, along with the scan of the original lonely pattern page #32. Another new year always brings the resolutions to take better care of ourselves. Eat better, exercise, get outdoors more, go for a walk, and just breath the fresh air. A big part of taking better care of myself, I found was to try to get a better night’s sleep. I would always get to bed exhausted after a long day’s work, but found myself having a hard time falling asleep, or tossing and turning all night long. I have tried earplugs, and swear by them, so I know it wasn’t noise. It was light. We all have so many electronic thingys attached to our lives that even when we go to bed, there may be the ambient light from an alarm clock, or even the light from a computer in the next room sneaking its way into the bedroom. I know it sounds crazy but to me even the smallest amount of light I was beginning to find bothersome. 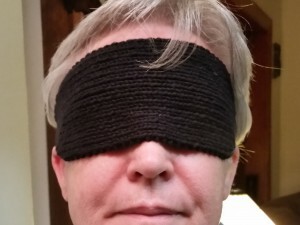 I tried store bought sleep masks, but they were hard to tie on every night and get the right fit, and were always slipping and turning around. Plus I never had any luck with washing them, even by hand , once washed they were never the same. 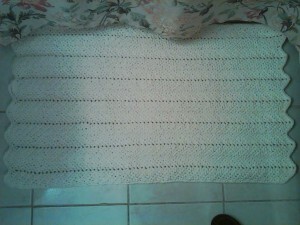 The only way out was to make one myself, and since knitting is “what” I like to do, I knitted one. It’s made from Lily Sugar’n Cream 100% cotton, knitted tightly on #3 needles in a K1,P1 rib to make it fit snug and keep out all those pesky bits of light. Plus it washes well, by hand in cold water, drying flat. I have made myself two, so I can always have a clean one, while the one in the wash dries. Plus no stings to tie, it is seamed flat in the back, making it one piece that can just pull snuggly on, and get the the shut eye I need. Moving on now to more resoluteness. 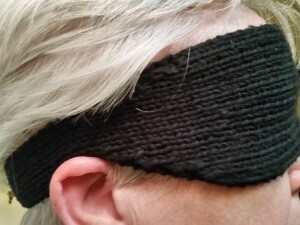 The pattern for this Cotton Sleep Mask is available through my Ravelry page. The truth is hard to hide or to deny, 2016, was a difficult year. Not just for myself, and for my family, but for so many friends. So I will not hide the happiness to see it go, but look forward with a new resoluteness, to seek out happiness and take better care of our precious gifts, life, loving, giving, moving forward and letting go. In an effort to resurrect this site, on the day after Mother’s Day 2016, I’d like to post about a gift from my own mother that surprised me beyond means. My mother was the own who taught me how to knit, and the one who still encourages me to fulfill what has become a life’s passion. She’ll still, at 86 years old, ask what I’m working on, and wants to know all about the yarns and patterns even though she herself has stopped knitting. Um, excuse me, you mean dad’s mom’s needles? She simply replied “Yes”. For me? Again simply “Yes”. My grandmother Emily Frances Menton Lynch was born in 1899, and passed in 1960, when I was just 5 years old. I don’t have any vivid memories of her of my own. I know she lived in Astoria, Queens, NY where my dad grew up and I faintly remember trips to visit her. But I may be just wishfully imagining that I remember. The thought of holding her needles in my hands, let alone being able to knit something with them, made my heart sing. Here I was reaching back into the past to imagine what could she have knit with these needles. Baby bonnets, little cardigans, maybe mittens for all her grandchildren, maybe even for me. 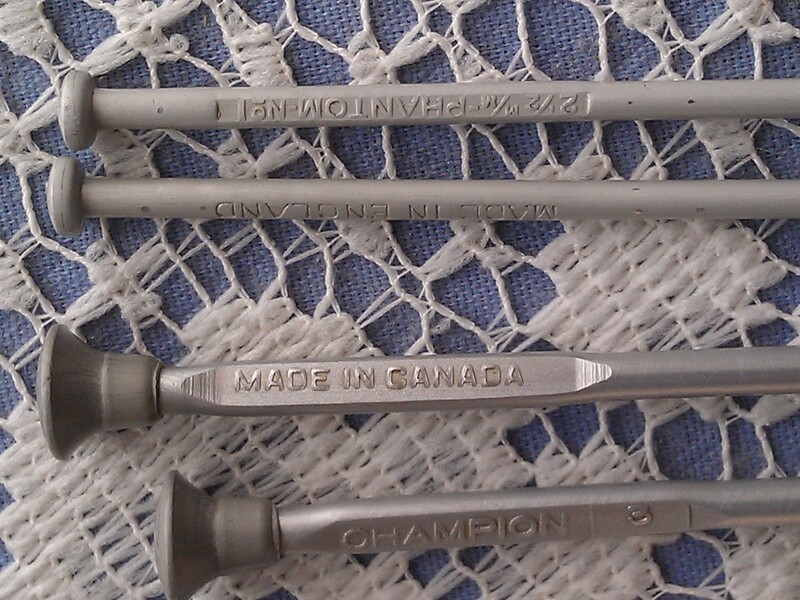 A pair of size 2 1/2mm Phantoms from England and a pair of size 3 Champions from Canada. Knowing how I love old things, old patterns especially, these needles will have new life, only now knitting for my grandchildren, Emily’s great great grandchildren. I love you Mom, thanks for saving these for me. I came to Florida for a vacation, to get away from quite possibly the coldest dreariest New York winters I can remember. I came to visit my parents, sister, brother, and their families. I came to get time off from my job, to change the everyday routine. I came to get out of boots, gloves, hats, scarves, and heavy coats. I came to get a little sense of flip flop freedom. Leaving New York in yet another snow storm and landing in Ormond Beach’s 77 degrees felt like I not just flew to another state, but another planet. Here was the sun shining, lush green growing, warmth I needed. In an effort to be outside in the sunshine, my sister suggested we visit a Native American Festival that was being held on the grounds of The Casements, John D. Rockefeller’s family winter home on the Halifax River. I have been to The Casements before and enjoyed the history and the beautiful views. So to fill my lungs with fresh air and get much needed sunshine on my face, and enjoy the views, off we went. It was much as expected, many Native Americans proud of their heritage, and proud to be sharing it with all those interested. I particularly enjoyed seeing the very young children carrying on the traditional dances. There were many jewelry, pottery and clothing vendors and historical displays. Really the kind of outing I enjoy. Then at the very end of the festival, sat a woman weaving. She was selling some belts, blankets and demonstrating her craft. My fiber magnet of course drew me in. 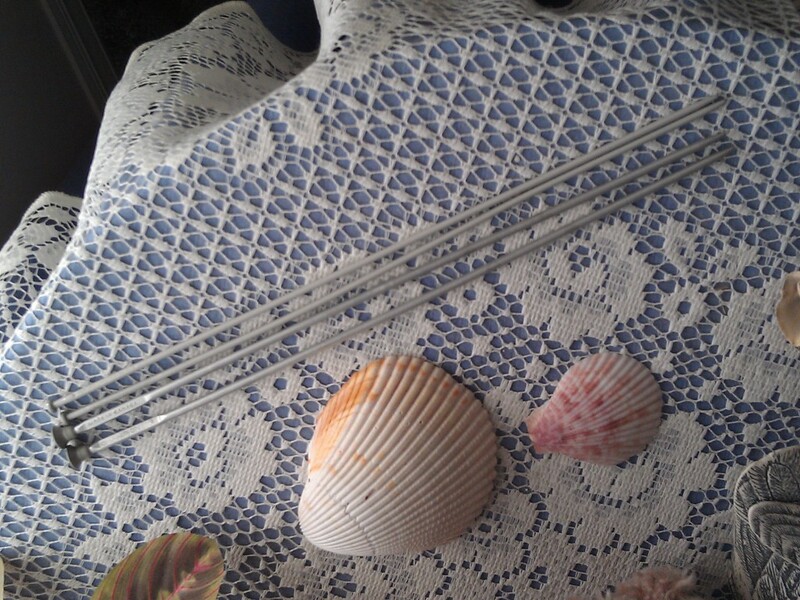 But it was the tidbit of history about some small items she was selling that intrigued me. She had a pile of simply sewn bags, with drawstring ties. On top of the pile was a piece of wood acting as a weight so they wouldn’t blow away. On the piece of wood was handwritten “Possibles Bags”. I learned that Possibles Bags have been used by many Native American tribes, traders, mountain men also, to carry whatever could possibly be needed for the day’s hunt or to hold personal items for their nomadic lifestyles. They were made in various sizes and from many different materials. Of course, I saw these as “Works in Progress Bags”. The bags that I keep my projects in that are currently being worked on. They hold the yarn, needles or hooks and patterns, and whatever is possibly needed to complete the project. It struck me that these small bags I tuck my projects into indeed hold the possible. The things I am working on, to make possible. They hold my dreams, my visions. So now I’m changing what I call my project bags to “Possibles Bags”, because they hold whatever I could possibly need and because I still believe anything is possible. History, leave yourself open to learn from it, in every possible way. A week ago Sunday, I ventured out and off this island to get into the city (the only city that can be referred to as just the city, NYC of course) and had the pleasure of participating in a class given by Franklin Habit at the Lion Brand Yarn Studio, “Working with Vintage and Antique Patterns”. If you are in any way interested, or just curious, about learning more about the history of hand knitting, I would highly recommend that you take this class, and get to meet the knowledgeable and thoroughly likable Mr. Habit. It was also my first visit to the Lion Brand Yarn Studio, which I truly enjoyed. All the yarns are cleverly yet neatly displayed making a feast for a yarn lovers eyes. The selection was huge, plus the new Martha Stewart and the LB Collection yarns are to die for! 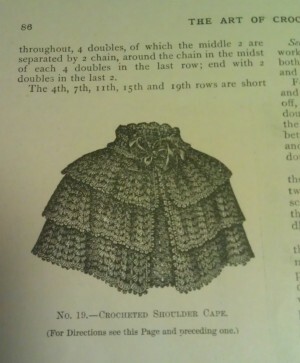 During the class Franklin introduced us to the collected works of Jane Gaugain, an Edinburgh shop keeper, who sparked a Victorian age knitting revolution. We even got to swatch a piece from one of her patterns, a leaf block utilizing a surprising amount of knitting techniques for such a small square bit of knitting. There was so much more, I can’t even begin to tell you. I left with a newly sparked imagination and the need to get serious about researching the patterns I have collected and getting them organized. I am not going to admit how many years, but I have been collecting “oldie” knitting treasures for quite some time now, both knit and crochet, books and patterns ranging mostly from the 1930′s through the 1970′s (the latter ones are mine, bought back then). So, I have an interest in the past and learning from what others have learned before us. 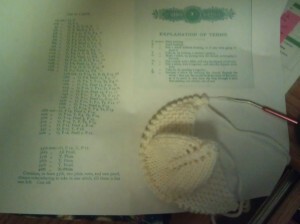 There are times I feel I have a real connection with the past, when my hands just do something when I am knitting or crocheting, without any conscious effort. Like some sort of saved past life experience, or memory that my hands just know how to do. 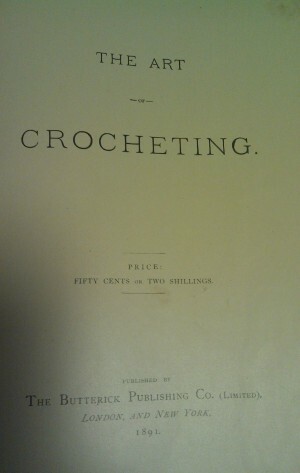 My only recreation from an antique pattern was from my oldest treasure, The Art of Crocheting, published by The Butterick Publishing Co. in 1891. 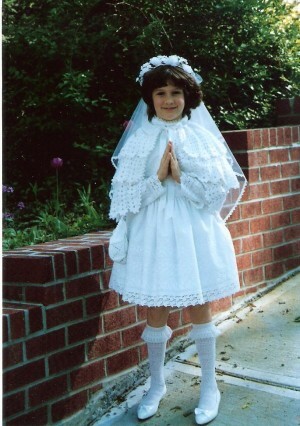 I adapted the Crocheted Shoulder Cape shown above for my daughter’s first communion day. Looking back on this now, I wish I had taken notes while doing it. You know what they say “Hindsight is always 20/20″. Live & learn, from now on I will be taking notes on any re-dos of antique or vintage patterns. There are so many patterns out there that have just been waiting for curious knitters and or crocheters to re-discover. So be brave and not afraid to experiment and try working up something from an “old” resource. In just glancing through some Needlecraft magazines in my collection, I found an adaption of the block we worked in class. Click to download below & then again at top of next page. If you can’t download this – email me at pattianne@pattiannes.com and I will forward it to you. I’m turning over a new leaf before the new year rears its ugly head and resolutions begin to pile up like all of my unread emails that have been saved for longer than I would like to admit. Mind clearing, stress busting freedom, get out of jail free, and get on with your life, instead of worrying about what I may have missed. New Year’s resolutions come & get me. So….. um, yeah, OK …. I was wrong…. there I said it, I admit it. Wow, what a relief to get that out of my head. Really, these past months of “disconnection” has kind of made me feel like my brain was about to explode. Let me explain, even though I have not been blogging about my knitting, spinning & crocheting, I have been indeed working at them, & everything has been stored in this new area of my brain created after I decided to step back for a while. Seems I have created a temporary cache folder, so to speak, in the back of my head, and this folder is named “stuff I could or should be blogging about”. Well, the folder is somewhat overflowing & it is giving me a headache trying to keep what’s in it from not falling out of the back of my head & leaving a big messy trail behind me. So where to begin in order to catch up? I had thought I would just review my phone’s pictures folder and thereby have an accurate date order of pictures of my work. But I upgraded from a BB (which I very much disliked) to an awesome HTC android thunderbolt (which I love). In the move I am certain that some pictures were lost, so I have had to do a lot of backtracking to be sure I did not miss anything. I am going to post pictures of only the finished projects instead of listing all the WIPs, because then things would really get out of hand. Taste of Aran Afghan knitted for my very special niece in Cascade 220 Super Wash.
Super easy bathroom rug, crocheted using two strands of Lily Sugar & Cream cotton held together, so it worked up super fast. Plus the thickness makes it nice & cushy under your feet. 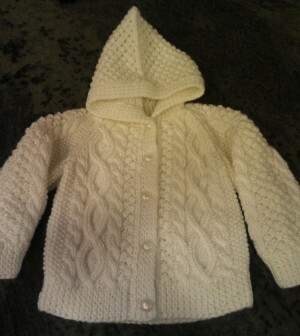 Hooded Baby Aran Sweaters – completed two. One went to an office mate who just had a beautiful baby girl, and the other is remaining “in stock” until needed. 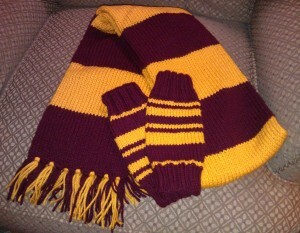 Scarf & mitts knitted for a fore mentioned niece now going to FSU, hence the school colors. More pictures to come when I have more time. That’s enough for now….I still have to spinning to get to. Ever seem to feel overwhelmed with keeping up with all the ” cyberosity” of knitting that has filled the web? Not that it’s a bad thing in any way at all, but being connected to so many yarn companies e-mails, internet sites, blogs, podcasts, Ravelry, FB & Twitter to seemingly keep up with all that’s constantly new in the knitting world, has well kind of got me on overload. Now, I never in a million years thought this would happen to me, but being sucked into this technology driven vortex has left me with a bit of an odd feeling. 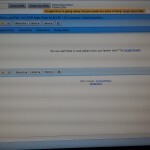 I am in the process of trying to learn more by participating in a Social Media Boot Camp offered thru Artfire.com. Often when the fast paced demands of life have forced me to put down my knitting, I invariably wind up wondering why I feel not like myself. Now this feeling has extended to time spent on Google Reader, reading emails, FB, etc… It is definitely turning into my hands on some sort of keyboard instead of my hands on my crafts. So with only two hands & limited amounts of free time, my dilemma is deepening. In an effort to chisel out time for myself & for my crafts, knitting, crocheting, spinning, I have tried to cut things out of my life that I do not find as rewarding. So I am consciously making an effort to walk away from the “connectivity”, so I can reconnect with what brings me joy. I would be interested in hearing how others feel about this & how they deal with dividing free time between their actual crafting & time spent connecting in this faster paced digital world.